Following the success of my first "Shadows Workout" this is just the second of what I hope will become a long series of CDs. As with Volume 1, I have attempted to introduce a different concept into the compilation. On the first CD I recorded six tracks omitting the rhythm guitar and on this one I have included three Cliff Richard titles featuring Danny White (of "Stars In Their Eyes" fame) on vocals; the format being: complete demo track, backing track including vocals but without lead guitar, and for the really ambitious, the backing track omitting both lead and vocals. So don't be shy, even Cliff must have started somewhere. Danny is an extremely talented singer in his own right who sings uncannily like Cliff and recording him has been quite an experience! 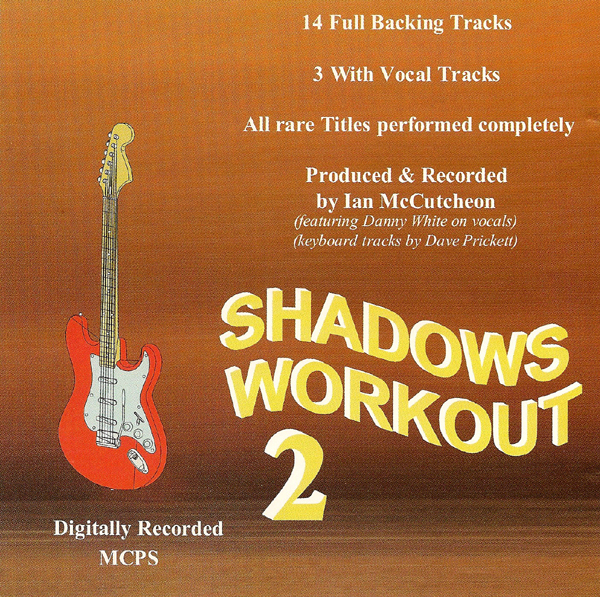 With the instrumentals as before I have recorded demonstration tracks for the rare titles to use as a basis for the solo and as with "Shadows Workout 1", the backing tracks are all performed in the same key as the Shadows versions with a meticulous observation of the original arrangements. I have, however, by popular request avoided ending with fade-outs as these can be detrimental when playing live. I feel I must at this point give a mention to Dave Prickett who has played the keyboard parts on both of my CDs and has so far gone largely unnoticed. his contribution is invaluable and absolutely brilliant (he can spot a 13th flattened 9th at 50 paces you know!). Thanks Dave. Finally, I have thoroughly enjoyed recording this CD and it is my sincere hope that you also enjoy playing to the tracks. Terry Darlison - Backing vocals on "Move It"